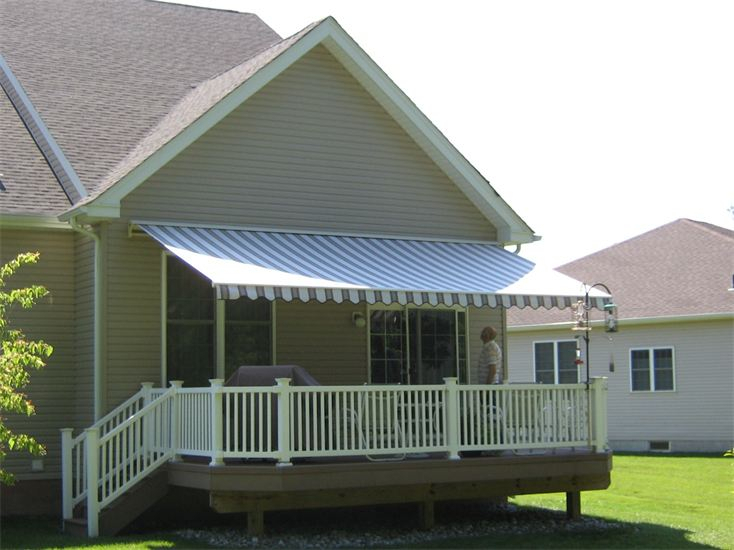 Awnings are a wonderful feature on any home or office building. The right awning can make a building more comfortable, reduce cooling costs during warm weather, and protect furnishings and people from harmful UV light. Many modern awnings are constructed from fabric, and there are a range of options to choose from. Looking at the different awning fabrics before you are ready to purchase can help you select the right awning for your needs. There are several types of fabric that are most commonly used for modern awnings. These include canvas, acrylic fabrics, vinyl and polyester composite fabrics and vinyl-coated fabrics. Acrylic fabrics are water repellant and are available in a wide variety of designs or patterns. These fabrics are well-suited to use in humid weather as well, due to their ability to resist mildew growth. Acrylic fabrics are also resistant to UV damage, and awning fabrics made from acrylic may be 100 percent acrylic or other fabrics that are acrylic coated. Vinyl and polyester composite fabrics are durable, waterproof and fire retardant. These versatile fabrics are also usually flexible and light. Vinyl-coated fabrics are often a bit heavier than other fabric options, but are still a good choice when UV or mildew resistance is a concern. Vinyl-coated fabrics are not available in as many designs or styles as acrylic fabrics, however, notes SFGate.com. Canvas was once a popular awning fabric, but its prominence has declined due to the introduction of newer fabrics. While canvas can be somewhat inexpensive, it tends to have a shorter useful life than more modern fabric choices. Canvas also is not fireproof unless it is specially treated. At JM Finley, we offer a wide variety of awning fabrics and styles from some of the leading manufacturers, including Recasens USA, Sattler, Sunbrella and Tempotest. Contact us at 610-505-5907 today to learn more about our line of awning fabrics and to select the right fabric awning for your home or business.